Eureka, FL--April arrived, and the time for the spring trip came. The destination was the Silver River and then the Oklawaha. This was new territory for the Fellow Travelers, and the plan was to meet at Rays Wayside outside Ocala, shuttle the vehicles to the O klawaha Canoe Outpost, and make the trip. Art Shelfer was late arriving, so the group missed the shuttle and had to do its own. However, it worked out fine and saved the group about $60 in shuttle and parking fees. When Art did arrive, he had George and Carol Royal with him and Janice. Those on time were Hamp Chauncey, Roy Moye, Jim Shamp, and Charlie Stines. Art's truck, Hamp's truck, Roy's Pilot, and the Suburban Profane were taken to Gore's Landing which was to be Friday's campsite. 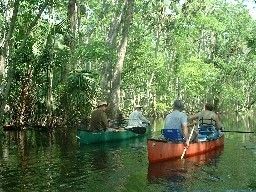 The drivers returned, the canoes were loaded, and the paddle upstream to Silver Springs began about noon. 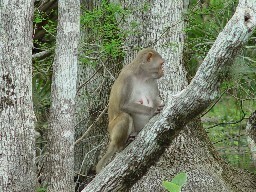 The crew had been on the river only a few minutes when the first group of Rhesus monkeys was encountered. These monkeys live in the area and were probably brought there by a man who did commercial tours of the river in the 1920s. The other explanation is that they escaped from the filming of Tarzan movies. In any event, they are there and provide unique entertainment. The Silver River is a spring run, so the water is clear. 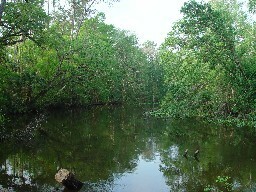 The area is swampy and provides no place for stops. Birds were everywhere, and some saw herons, ibises, ducks, hawks, cormorants, anhingas, egrets, a limpkin, and lots of songbirds. The logs were covered with turtles basking in the spring sunshine. 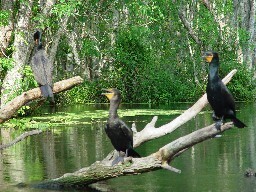 A few all igators lay on the sides of the river. Wildflowers seemed to be at their peak. The current was not unpleasant, and paddling upstream was not particularly difficult. Hamp soloed the Penobscot 16, and Roy went it alone in his Mohawk 14. George and Carol paddled Charlie's Mohawk, Art and Janice had the Penobscot 17, and Jim and Charlie rode in the Canadienne. The theme park area was reached about three. Actually, the theme park is the least interesting part of the Silver River run. Although there was plenty of canoe and motorboat traffic the entire trip, the park area was especially full of boats, especially the tour boats operated by the park. After exploring the spring, the float downriver began. Daniel Butler and Kathy Kinder, by arrangement, had agreed to put in when they arrived at the wayside park and attempt to catch up with the group. They were at the entrance to the park photographing monkeys as the others came downstream. The journey downstream was easy, and this is one river that is worth seeing twice in the same day. Upon returning to the wayside park, the group met Greg Baker. Tim Eidson came while Greg was loading his canoe, and he joined Hamp. Only Greg and Ro y would solo for the remainder of the trip. It was after five when the park was departed, and it was supposed to be only a short distance to a suitable campsite. Daniel had done the river before and had marked several sites on his GPS. Unfortunately, alll were either posted or occupied. The paddlers forged ahead, and the chances of finding any campsite seemed to dim with the approaching darkness. The river was very pretty, but not clear like the Silver. It is a very winding path with some obstructions to dodge, but nothing to present real hazards or require pulling over. Daniel and Kathy made a stop to check a geocache Daniel had planted on a previous run. The terrain is very swampy, but there were some high clay bluffs and a few grassy areas which, as noted, were either occupied or posted. A terrific campsite finally appeared on the right-hand bank. It was large and grassy, and the foundation of a building provided a cooking area. By the time the tents were to be pitched, it was dark. George and Carol prepared an excellent supper of beef stroganoff. There was too much food at every meal because six people who had signed up for the trip cancelled after the food had already been purchased. The weather remained nice. Someone built a nice campfire, and the group swapped stories until bedtime. Bugs were not a problem, probably due to the brisk friendly wind. Daniel and Kathy elected to sleep under the stars, but everyone else hit the tents to recover from several hours of canoeing. Da ylight came, and Charlie made twenty cups of coffee, which was not enough so another twenty cups had to be brewed. Roy prepared his typical gourmet breakfast of Bubba's Bodacious Breakfast Burritos. It met the Moye standard of excellence. Since the group had paddled much farther than expected on Thursday, there was no need to hurry to leave. Eventually camp was broken, the canoes loaded, and Friday's trip to Gore's Landing began. The river remained very pretty. The wildlife was not as plentiful as on the Silver, and there were almost no turtles. This was surprising considering the number seen on the Silver. A lone gator was spotted. An osprey led the way for a couple of miles, flying a short distance downriver each time the canoeists got within about fifty yards of him. The scenery remained very pretty, and there was no houses along the river. There was another group camping downstream, and there were a few other boats. All the motorboats on the river took care to cause no disturbing wakes. Gore's Landing is a county park which has running (sulphur) water and toilet facilities, but no showers. The travelers arrived shortly after noon and had the choice of great campsites. After pitching the tents, Roy and Hamp took Tim, Daniel, and Greg back to the wayside park put-in to retrieve their vehicles. There were several other campers at the landing, including a group which had come to scatter ashes of a descendant of Will McLean, the person for whom the county park is named. All of the campers were well-behaved. Diane Stines and Sally Shamp drove down to bring the fixings for supper, and Diane brought some nice desserts. The King prepared a very tasty low country shrimp boil. There was a considerable portion left over due to the no shows, but the campground hosts seemed delighted to take it for their supper. The Weatherman cooked a poppyseed ( opium cake?) in his Dutch oven, and it was all eaten. Sally brought Jim's baby guitar, and Jim played and sang some silly songs. Daniel also picked the guitar a little, and did it very well. Greg told his Prince Albert story. Since Donald was not there to protest and Joey Autrey was not there to defend the honor of his kinsman, Charlie was allowed to tell his town drunk story. The Knave had a lot of stories concerning events leading up to and following the incarceration of his former boss. The weather was threatening rain, and the threat became real. Charlie had erected his outfitter wing, and there was room for everyone to fit underneath as the story-telling and lying continued. The cakes and pies Diane brought were eaten except that Charlie dropped one, converting it into coconut upside-down cake. Finally, everyone went inside the tents for a good night's sleep as the driving rains tapped not so gently on the tents. It was still raining when daylight came. Charlie again prepared a pot of coffee. Art and Janice cooked eggs, honey-seared ham, and grits for breakfast. Although it lacked the Moye artistry, it was tasty. (The Weatherman is offended that the writer stated that the breakfast lacked the Moye artistry and is now contacting other Fellow Travelers in attempt to organized a king beheading party. The King, in his other role, is considering prosecuting Shelfer for terroristic threats, and Art is in real trouble because Joey Autrey is acting as the Weatherman's attorney.) The rains ceased, and the weather looked good. But there was debate as to whether or not to continue the trip to SR 316 at Eureka. Indecision was the winner, and finally the canoes were loaded and everyone went home. The trip was a pleasure. If it is done again, the put-in will need to be earlier in order to assure reaching camp before dark. Hey, this one would have been great even if there had been no monkeys.